Sony will launch a streaming music service, “Music Unlimited powered by Qriocity,” by the end of the year, the company said Wednesday at the Internationale Funkaustellung (IFA) trade show in Berlin. Sony’s Howard Stringer speaks at the IFA consumer electronics show in Berlin. Sony didn’t announce many details about the upcoming service, but users will be able to access millions of songs, according to the company. At first, Music Unlimited will be accessible across Sony’s latest models of network-enabled Bravia TVs, Blu-ray players, Blu-ray home theater systems, the PlayStation and Vaio computers, Sony said. The company then aims to allow users to access the service via its portable devices, but it did not elaborate on specific products. Another member of the Qriocity family is “Video On Demand powered by Qriocity,” which allows users to watch movies on demand in both high definition and standard definition. The service has been available in the U.S. since April and will be rolled out in France, Germany, Italy, Spain and the U.K. this fall. 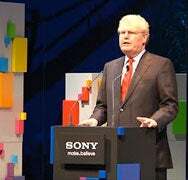 Sony CEO Howard Stringer also hinted at IFA at an upcoming TV service based on Google’s Android-based TV platform, plans for which were announced earlier this year. Sony Internet TV will revolutionize the television experience and will be the world’s first true Internet service, according to Stringer. Viewers will simultaneously be able to search and access all of their TV channels as well as Web-based applications from wherever they watch TV, he said.